It's been pretty warm around here lately and blueberries are still in season. We just stocked up on a few quarts and froze them for the rest of the year and I used some of them to make these cute little blueberry button cookies for a family picnic. This recipe comes from Taste of Home magazine and I marked it to try as soon as I saw it. The cookies were definitely tasty and pretty cute, though the texture and even the smell reminded me of a mini blueberry pancake! I think that if I made them again I would refrigerate the dough for a while to help keep them from spreading so much. However, they still turned out good and were a hit at the picnic. With September just around the corner, I know I'm not the only one who is starting to think of fall... 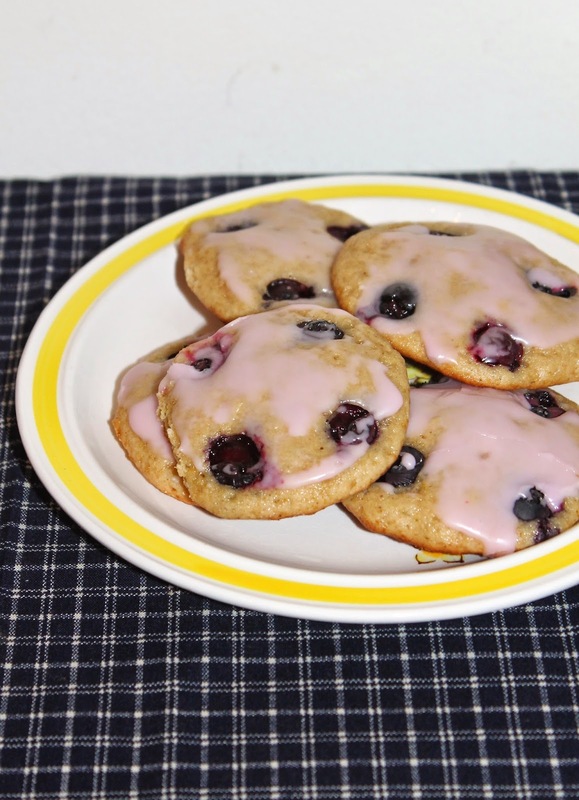 However, it's not quite time for fall foods yet and these blueberry cookies are a nice addition to a late summer table. The below recipe is my slightly adapted version (the original is at the link above). It will make about 2-1/2 dozen cookies. I recently remembered eating big puffy and somewhat crispy eggs in Thailand and wondered why I had never attempted to recreate this dish at home. It's really just a simple omelet, although it's not folded and stuffed like we would often think of when we hear the word. Also, with Thai-style omelets, you want some brown on your eggs and some crispness. These were often part of a larger family-style meal and always served with rice. I made mine into individual omelets and served them with Sriracha and some pickled cabbage I made the night before along with Jasmine rice for a complete and quick dinner. This dish is a nice change-up from your typical eggs and turns them into a meal suitable for lunch or dinner. The recipe below is for one individual serving omelet. I simply used scallions, but you could add other things like shallots, cooked pork or chicken, etc. 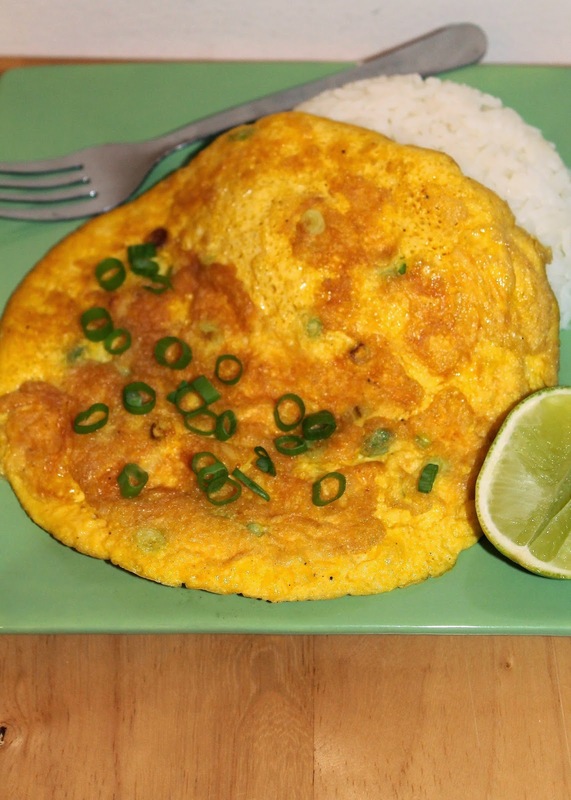 You'll want to get some egg and rice together in each bite (Sriracha is a must for me). I have a problem when it comes to most pies. That problem is that I cannot wait until they fully cool to cut into them and eat them. This causes them to be on the runnier side, especially fruit pies. But it's a risk I'm willing to take (and, actually, I kind of like the juiciness, especially when it's served with ice cream). So as you can see from the photos below, we dug into this blueberry pie while it was still warm - a nice contrast the the vanilla ice cream on top. 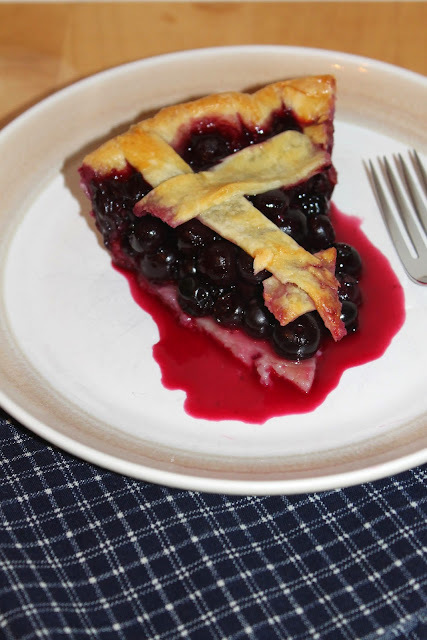 You can use tapioca in your fruit pies instead of cornstarch of flour and it will make the filling thicker. Blueberries are in high season here right now. This pie came about from a little mistake. We had froze a few pints of blueberries for the winter. We froze them on a baking sheet and then transferred them to a freezer bag. Somehow, one of the bags of frozen blueberries ended up in the fridge instead of the freezer -- oops. So, instead of trying to re-freeze them (they probably would have turned to mush), we made pie instead!